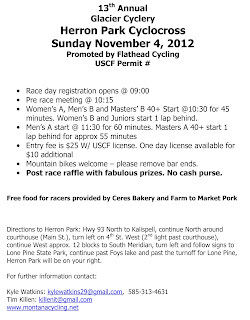 2012 has proven to be a physically, mentally, and emotionally challenging year for cross racers in Montana. A hot and dry summer left thick smoke lingering for the first several races, rider numbers in the upper categories have been noticeably depressed, and injuries or illness plagued the strongmen and household names. 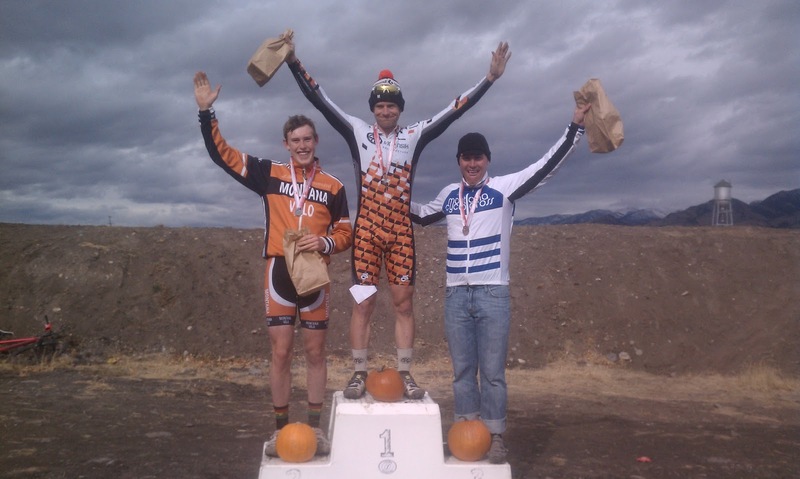 And while it is easy to get discouraged about racing in the state this adversity has allowed our best riders to shine and garner the recognition that they deserve. In a lot of ways this weekend's State Championship races were fitting cap for the season. Saturday's Mule X featured a clay mud that wrought havoc on equipment and claimed at least have a dozen derailleur hangers before the race even started. Through the muck the race persisted and allowed an inspired ride by Bieber-Mule, who held onto Coach Curry until the Pug from the Great White North encroached on their gap and the pace hastened over the last few laps. 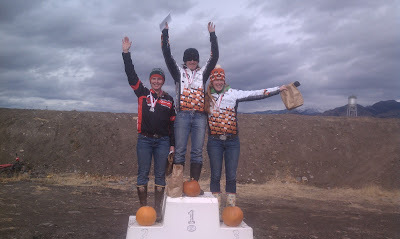 In the end "Cougar Bait" Beckner stood on the top step for the last time this season. Conditions on Sunday were more amiable for finishing races and a rerouted course, a drier day, and the tireless efforts of the Bozeman promoters kept the most damning of the mud at bay. But the parcours was not without pitfalls and the action not without incident. Eventual winner Admiral Lord Curry was a familiar sight in the pit area as he frequently changed bikes while the neutral support worked feverishly to keep the race running (one benefit of small fields is that one neutral mechanic is sort of like a team mechanic for everyone). He punished the field over the short and punchy climbs that accented the back side, and left more than a few reevaluating the wisdom of playing one's trump cards on Saturday. The result was a podium that any Montana cyclocross fan can probably recite from memory by this point in the season with John Curry on the top step, followed by Landen Beckner and Jesse Doll. The ladies race was the same knock down, drag out affair that we've seen replay time and time again since September. The Curry Dynasty endures as Lisa proved once again to be insurmountable at home. Bozeman's Megan Lawson and Missoula's Ingrid Lovitt rekindled their grudgematch with ferocity unmatched since Belleau Wood and on the second day the Lady Lovitt found redemption. The short and spirited cyclocross season in Montana is drawing near to a close as our short attention spans are thinking about elk and we forget that the skiing isn't actually usually very good until some time in January. 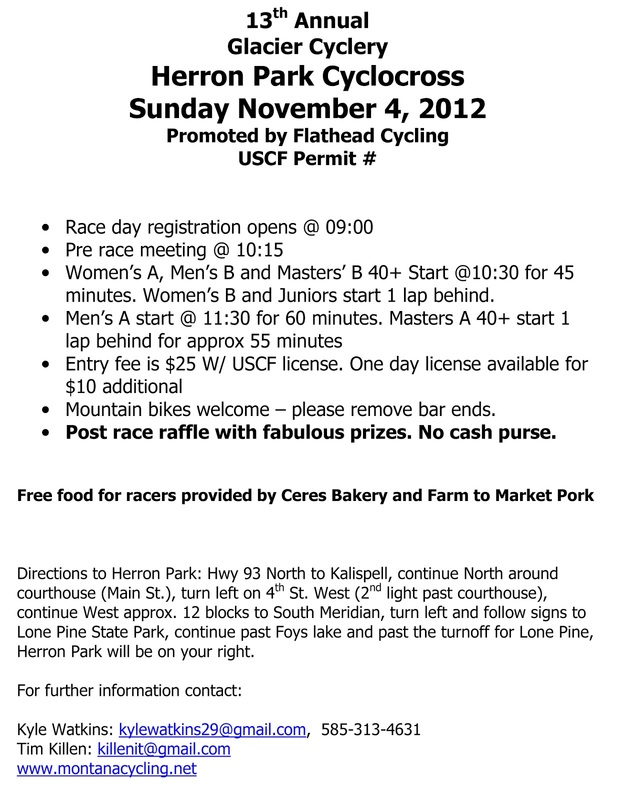 Only one event remains on the 2012 calendar for the state, and the Glacier Cyclery crew always does a fantastic job with Herron Park cross in Kalispell. This is the last race of the season around here, and it's probably worth just seeing this whole bike racing thing through to the end. Remember, this is pretty much it until the warm and sunny Montana spring road season. The future of racing in the state hasn't been this promising in recent memory. The mens' and womens' Category 4 fields are teeming and the riders at the front of those groups are all due for a new start time, young riders Ben Hoffman and Landen Beckner are already wicked fast and improving at a disconcerting rate. I, for one, can't wait for the next one. We'll see you in Kali.